Breakfast at my parent’s house is the best. Nothing is better than going home for the weekend, sleeping in my old room and waking up to my parents making me breakfast so I can get in some extra zzzz’s. Makes me feel like a kid all over again. So making the most beautiful, yet laborious, crepe cake seemed like the perfect thing to make for mom for Mother’s Day brunch. Each of these delicate crepes are layered with a fluffy lemon mascarpone creme and topped with plump raspberries and fresh flowers. 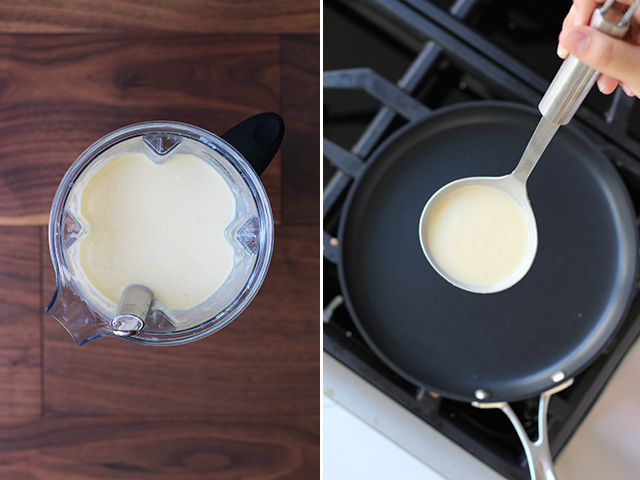 If you’ve failed at making crepes in the past, as I have, I’ve got some foolproof tips on making a flawless crepe. It’s absolutely glorious and worth giving it a try – your mom deserves it, after all! To make the batter, combine the flour, eggs, milk, mascarpone, salt and powdered sugar into a blender and give it a good whiz until smooth. Turn the heat to medium low and ladle 1/4 cup of batter onto a 10″ non-stick pan. There are a few tips and tricks to making the perfect crepe. The first is to use a non-stick pan – I’m using a non-stick 10″ crepe pan here. Keep the temperature at a medium low heat and do not butter the pan! Butter will make the batter soggy – making it difficult to flip. If you are using a non stick pan, there is no need for butter. 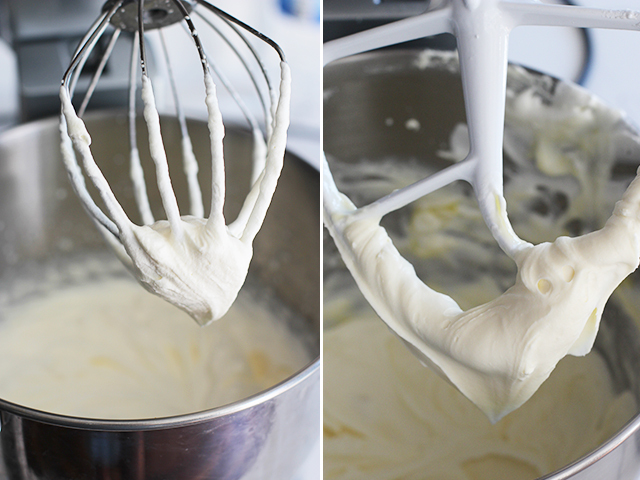 As you are pouring the batter, lift the pan and rotate it quickly so the batter spreads evenly. Let the crepe almost cook entirely through before turning it over. It should take about 90 seconds on the first side. If the batter is setting before spreading, the heat is up too high. If the crepe is falling apart or folding on itself when you try flipping it, it’s because you haven’t let it cook long enough on one side. Give it time! 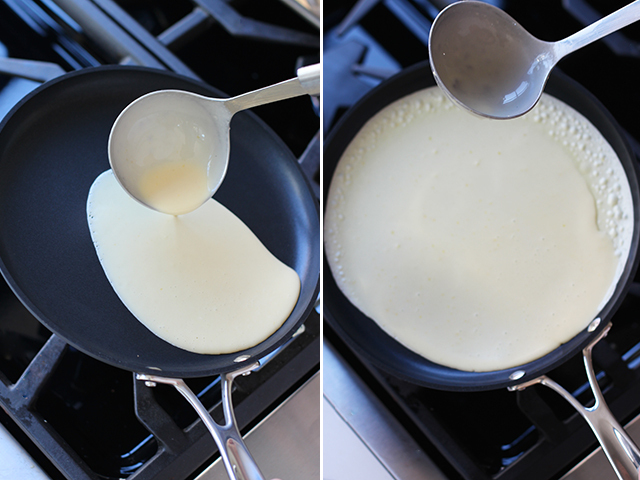 Use a rubber spatula and your fingers to turn the crepe over. Cook for another 10-15 seconds and place the crepe on a foil lined baking sheet. 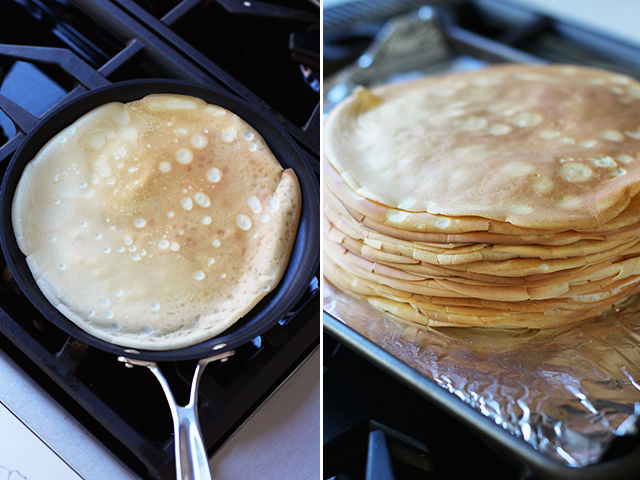 Continue making crepes, piling them on top of each other – remember that the cream will add height to your stack. Allow to cool for a few hours before assembling with the pastry cream. It can even cool, unwrapped on the kitchen counter, overnight. Meanwhile, combine the whipping cream and caster sugar and whisk until it forms soft peaks. Set it aside. 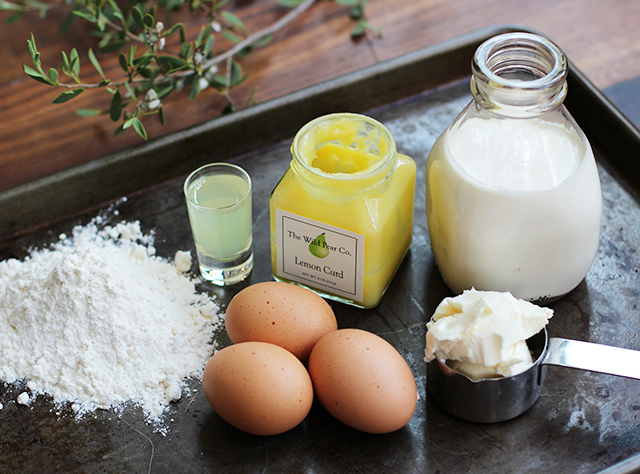 In another mixing bowl, mix the mascarpone, lemon curd, and limonchello until blended. Gently fold the whipped cream into the mascarpone mixture. The cream should be light and smooth. 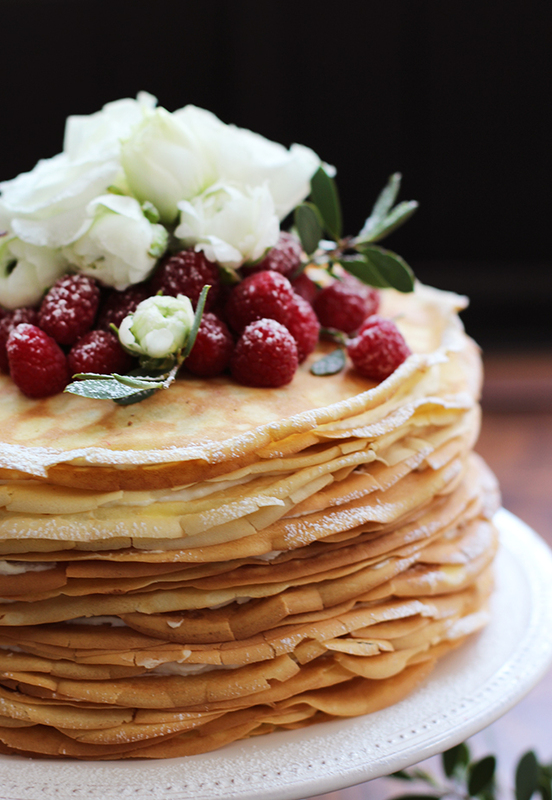 Once your crepes have completely cooled, place the first layer onto a cake stand. Give it a dollop of cream and spread it evenly. 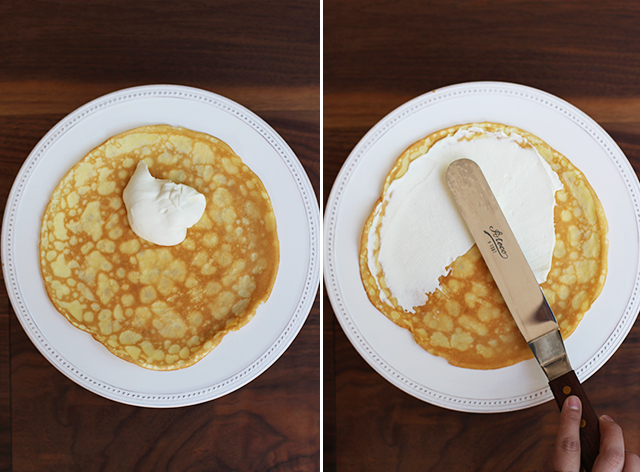 Continue adding layers of crepes and cream until you’ve reached your desired height. I used 25 crepes here, which was just barely pushing the limit. I was tempted to add more, trust me! Top it off with a pile of fresh raspberries and a dusting of powdered sugar. Chill in the refrigerator until ready to eat. Trade a slice for a smile. Happy Mother’s Day! Wow…I’m so inspired! Want to try this!!! Made this for my Dad’s bday today! I usually use a family recipe for crepes that is very different, so I was nervous about reinventing the wheel, but this recipe worked out great! (Actually, I tweaked it slightly because I could only find $6 mascarpone so instead I put in neufchatel and a bit of yogurt – didn’t notice any problems). 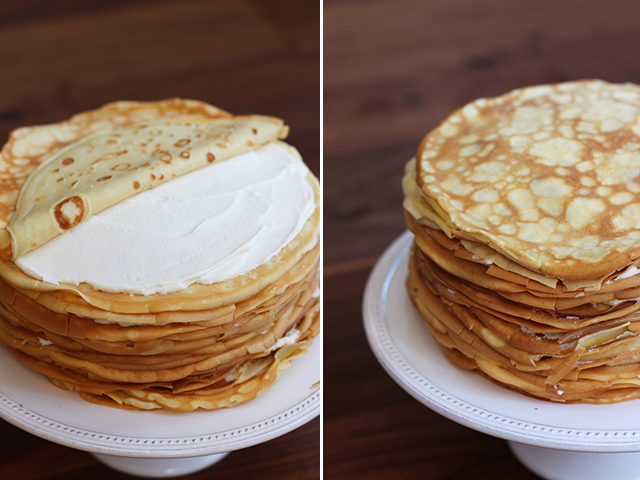 I’ve been wanting to make a crepe cake for forever, thanks for the great recipe! Ysidra, there are no raspberries in the cream. What you’re seeing is the raspberry smudged on the sides as a knife was ran from top to bottom to cut the cake. Why does it look like raspberry in the cream spread but not mentioned in recipe? I have made crepes before, but I’m wondering can you make them ahead of time and package them and place them in the freezer? Or is it better for them to be eaten on the someday that they are prepared? Just made this for Thanksgiving. It turned out to be amazing, and everyone enjoyed it. You list in crape ingredients mascarpone etc yet don’t say to add all the listed ingredients when mixing dough?? Please let me know if not all of these should go into the dough. Thanks A bunch! 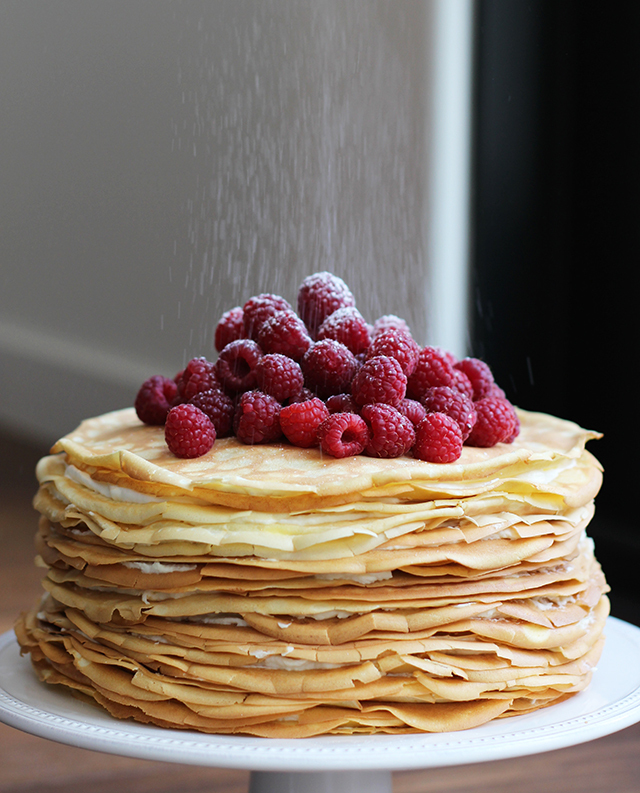 Wow, that is an absolutely stunning crepe cake! One of the most beautiful ones I’ve come across! 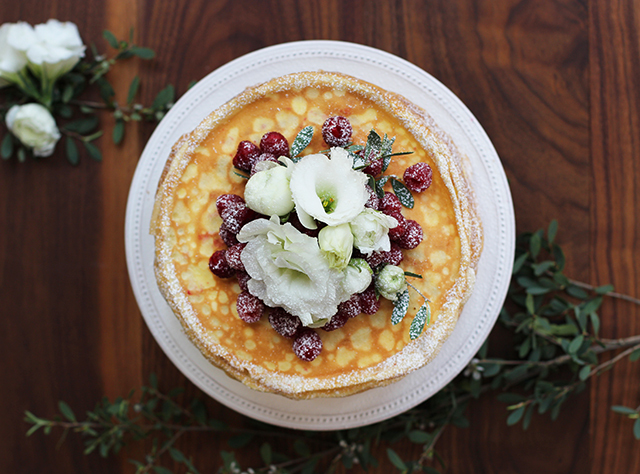 Really want to make this cake, dont have mascarpone for crepes, what can i used sometining different? That’s awesome, Anca! You can definitely make the cream beforehand – just make sure you cover and keep refrigerated until you’re ready to assemble. Enjoy!! Under crepe ingredients, there are two ingredients not mentioned in the commentary. Do the vanilla and lemon go into the crepe batter at the same time as the other ingredients? Yum! 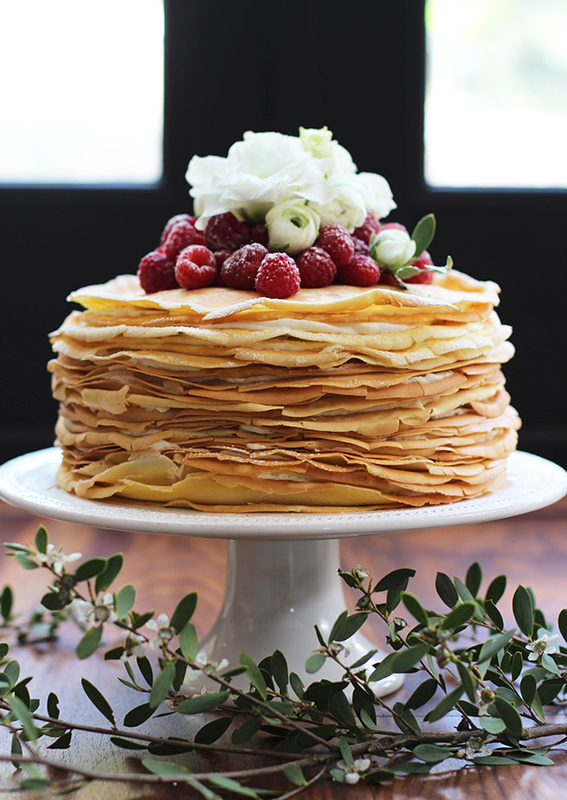 I saw a crepe cake in a Martha Stewart Wedding magazine and couldn’t get it out of my head. That was what my husband and I had at our wedding! We alternated the layers with custard and dark chocolate. I could sure go for another piece! I would love to try this recipe but exclude the limoncello. Do you have any suggestions for a replacement? I used this for my mom’s birthday today and she loved it! I added Nutella in the middle and strawberries in between the layers. Looks absolutely delicious! Would there be any alternatives for the limoncello? Or would it be detrimental if I removed it completely? Thanks! @Stephanie, you can substitute the limonchello with any other liquor. Cassis or Grand Marnier would be lovely alternatives. If you are trying to avoid alcohol, you can omit the alcohol altogether. This is gorgeous and fabulous for Mother’s Day! So pretty! I have a confession to make: I love making crêpes but have never had a crêpe cake. It would be time to change that, right? i saw this on instagram and drooled all over myself. this cake is so beautiful and simple (in idea – obviously not in effort!). lovely job and happy family time! Wow! This is just stunning! I too love going to stay with my parents. There is so much comfort within the 4 walls of my old room and the familiar sounds and smells of my childhood. Thanks for helping me remember that. This looks so delicious and (almost) too pretty to eat! This is simply gorgeous. Love the flowers and fresh raspberries on top. BTW I have the cutest giveaway on my blog at the moment to honor Mother’s Day and help the effort to save the bees. Please enter – I have TWO prizes to give out and will mail internationally! 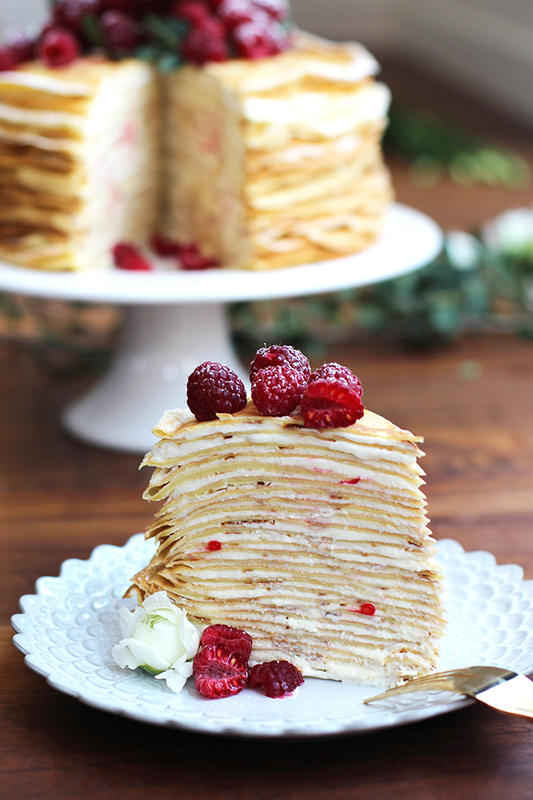 What a stunningly beautiful crepe cake and so perfect for Mother’s Day breakfast. I just might have to try this next weekend. Thanks! gorgeousssss..i have never made crepes in my life and seeing this just makes me happy. That looks tedious to make and incredibly delicious. And I love that little jar of lemon curd. Can I have a slice? yes!! this is beautiful. i am IN LOVE with that overhead shot. Ahh this is so gorgeous!